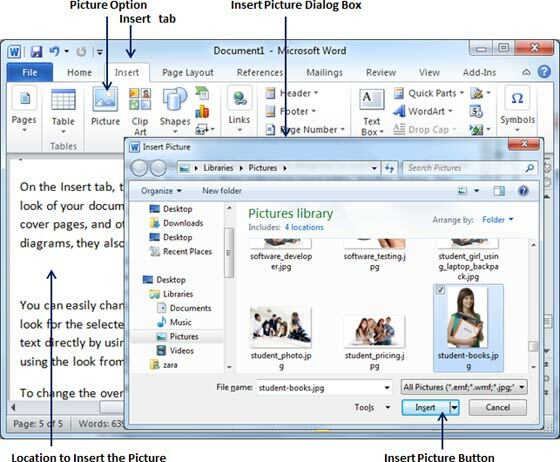 Following are the simple steps to add an existing picture in your word document. 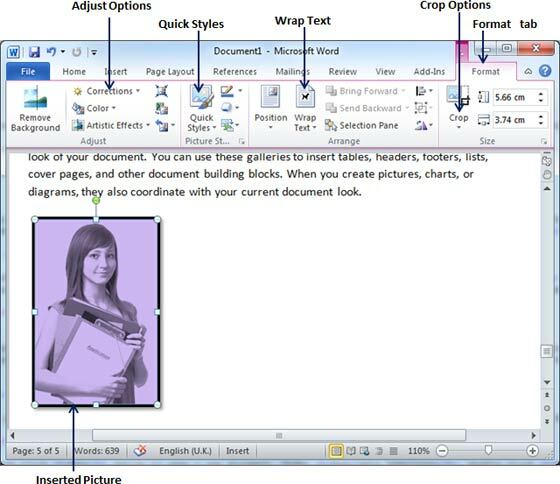 It is assumed that you already have a picture available on your PC before you add this picture in your word document. Step (1): Click in your document where you want to add a picture. Step (2): Click the Insert tab and then click Picture option available in illustrations group, which will display Insert Picture dialog box. Step (3): You can select a required picture using Insert Picture dialog box. When you will click Insert button, selected picture will be inserted in your document. You can play with your inserted picture in different ways, like you can apply quick styles to your picture, you can resize it, or you can change its color it. To try it, just double click your inserted image and Word will give you numerous options available under Format tab to format your inserted graphics. You can try yourself to insert other available graphics like Clip Art, Different Shapes, Charts and Smart Art or Screenshots. Just click over them and you will find your way very easily. Word Art provides a way to add fancy words in your word document. You can document your text in a variety of ways. 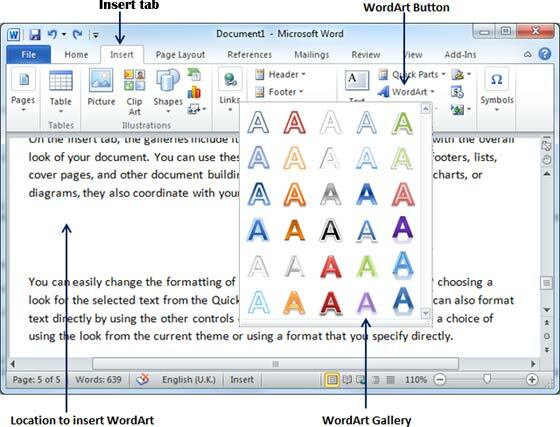 Following are the simple steps to add a WordArt in your document. 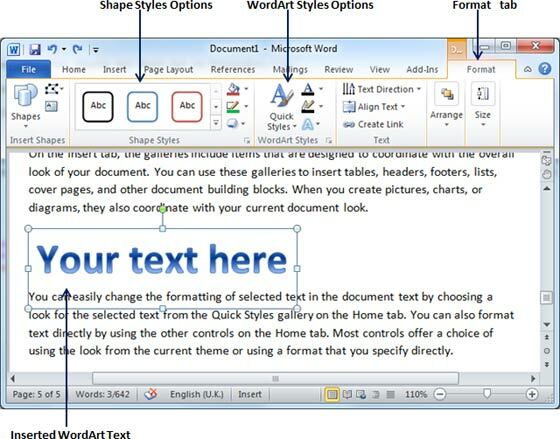 Step (1): Click in your document where you want to add a WordArt. Step (3): You can select any of the WordArt style from the displayed gallery by clicking on it. Now you can modify the inserted text as per your requirement and you can make it further beautiful by using different options available. To try it, just double click your inserted WordArd and Word will give you numerous options available from Format tab to format your image. Most frequently used options are Shape Styles and WordArt Styles. You can try yourself to apply different options on the inserted WordArt by changing its shape styles, colors, WordArt Styles etc.